POLITICIAN, author, intellectual – there are many ways to describe the polymath that is Mr Shashi Tharoor. But in India right now, he conceded in conversation with Arundhati Subramaniam, there was a political urgency about defining or at least debating the parameters of the faith of nearly some 80 per cent of all Indians. To him, Hinduism is not about tolerance as is popularly ascribed – it is more – it is about acceptance, he affirmed. No one has the monopoly on truth and so there is no question of tolerating someone – you do that when you believe you are right and others simply have the freedom to be wrong. Therein lies the basis of Hinduism’s much wider plurality, he posited. He spoke affectionately about his late and very religious father. “But his faith was private,” asserted the one time high-flying United Nations diplomat, before becoming an MP for the opposition Congress Party in his native Kerala. He argued that the rise of Hindu Nationalism, led as it is by the current ruling Bharatiya Janata Party (BJP) in India, is taking people away from the wisdom and insight of its great sages. “For so long we believed the phrase – unity in diversity, but what they (political Hindus) want is uniformity,” he claimed. In his book, he has gone back to the thoughts and philosophies of some of Hinduism’s most revered thinkers from the 8th century fellow Keralite monk, Adi Shankaracharya to the 20th century icon of Hinduism and nationalism, Swami Vivenkananda (he was a fierce opponent of Colonialism as well as one of the first and foremost advocates to explain Hinduism to the West). Tharoor talked of a sense of “betrayal” of those who are leading political Hinduism and said that he could no longer standby and let them define who and what Hindus are and what they stand for. By not speaking out, he feared Hinduism was being defined more and more narrowly and too politically. What he saw was a modern, liberal, inclusive 21st century religion with lots of freedom within in it. More recently, some have been calling for the Constitution of India to be changed because its founding fathers were essentially English liberal intellectuals in Khadi type clothes and Nehru jackets. At times, some in the BJP, including the prime minister Narendra Modi have upheld the constitution of India, while others are increasingly are calling for it to be reformed to a recognise a country that is not really secular but deeply religious, and predominantly Hindu. 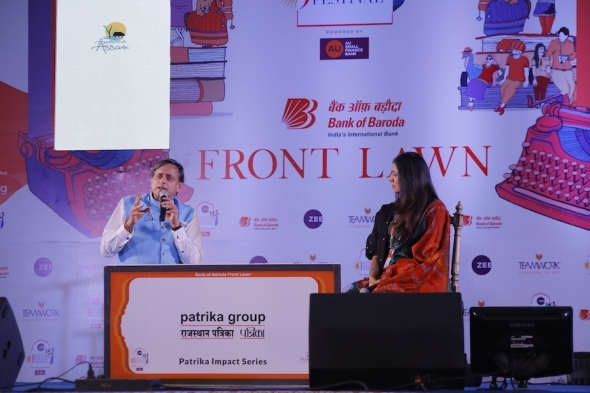 “You cannot have the Constitution and ‘Hinduvta’ (as defined by some of the harder BJP ideologues) together – you can have only one and not the other,” Tharoor argued. Earlier, almost as an example of the increasingly bitter culture wars being fought in India, JLF attendee Prasoon Joshi, issued a statement withdrawing from participating. He just happens to be the head of the Film Certification Board of India, which at the tale end of last year gave the film, ‘Padmaavat’ the green light after months of bitter opposition from regional Rajput groups, who felt their reputation and standing was being sullied by Bollywood director, Sanjay Leela Bhansali. Much of India can now see ‘Padmaavat’ but not Jaipur in Rajasthan – many of the protest groups are based in the state and Joshi said he did not feel it fair on others to attend, while the controversy continued to rage. Sanjoy K Roy, managing director of Teamwork, which produces the festival, said the police were committed to providing safety for all and that Joshi’s decision was a personal one. He said this in what appeared to be an impromptu press conference on the terrace where the press area is. On a purely personal level, it is reassuring to have the police there in numbers at JLF and they are very low key, friendly and polite. One of the festival highlights of the morning was American Chinese author Amy Tan talking about the runaway success of her first novel, ‘The Joy Luck Club’. In an entertaining and enlightening session with award-winning novelist with Siddharth Dhanvant Sanghvi, the two discussed Tan growing up in America, finding out belatedly her mother had abandoned three young children to emigrate to the US with a man she was having an affair with – though reconciled now to all of them, Tan recounted an occasion when her mother actually threatened to kill her and had a weapon in her hand. To find out what happened and how she avoided an ignominious fate, you will need to read Tan’s new work, a memoir, entitled ‘Where the Past Begins’. *This story concludes our live coverage of JLF 2018.